Old Keb Wisting is somewhere around ninety-five years old (he lost count awhile ago) and in constant pain and thinks he wants to die. He also thinks he thinks too much. Part Norwegian and part Tlingit Native (?with some Filipino and Portuguese thrown in? ), he's the last living canoe carver in the village of Jinkaat, in Southeast Alaska. When his grandson, James, a promising basketball player, ruins his leg in a logging accident and tells his grandpa that he has nothing left to live for, Old Keb comes alive and finishes his last canoe, with help from his grandson. Together (with a few friends and a crazy but likeable dog named Steve) they embark on a great canoe journey. Suddenly all of Old Keb's senses come into play, so clever and wise in how he reads the currents, tides and storms. Nobody can find him. 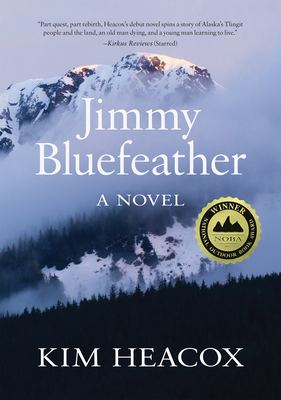 He and the others paddle deep into wild Alaska, but mostly into the human heart, in a story of adventure, love, and reconciliation. With its rogue's gallery of colorful, endearing, small-town characters, this book stands as a wonderful blend of Mark Twain's The Adventures of Huckleberry Finn and John Nichols's The Milagro Beanfield War, with dashes of John Steinbeck thrown in. Kim Heacox is the award-winning author of several books including the acclaimed John Muir and the Ice that Started a Fire and the novel Caribou Crossing. His feature articles have appeared in Audubon, Travel & Leisure, Wilderness, Islands, Orion, and National Geographic Traveler. His editorials, written for the Los Angeles Times, have appeared in many major newspapers across the United States. When not playing the guitar, doing simple carpentry, or writing another novel, he's sea kayaking with his wife, Melanie or watching a winter wren on the woodpile.